Look what I got! Collecting beautiful quotes, clean jokes, and positive musings to put a smile faces. Send me a suggestion. I’ll share it on my board. Today, I heard of an at-risk teenager lost too soon. A friend from college posted that she lost her dad to a year long disease. More trauma from the shootings in Florida and heard from another grieving gal just a few years older than me. This world aches with loss and reels in the after-math of things outside our control or understanding. Today daffodils also bloomed on my kitchen table. A baby was born. The third one this week from my friends and family. New, fresh, tiny humans waiting to make this world a more beautiful place. Babies keep being born. Life continues to sprout through the dirt and petals unfold to the sun. We exist in both of these spaces. In the dark and the light and the shadows and glitter in between. Think on that and read these quotes reflecting on beauty. We need it in this aching, hurting, blooming world. I’m back on the bean. The truth will set you free, they say, and the truth is tea is just not as good as coffee. I tried. I failed. I’ll drink a bit more Earl Grey tea , but coffee has my heart. I’m trying to limit the vanilla syrup and switch to honey. Again, not as good. But I’m sipping my way towards less sugar and more love for myself when I “slip up”… or sip up. I crack myself up. Ahh February. Typically the weather is colder, we get more snow, and I’m sad because Christmas and my birthday are over. February means I’m in for the long haul towards Spring. It’s not my favorite month, but here are a few of my favorite things that can make the month more bearable. My friend got me a changeable letter board for my birthday and I am so excited! I am using it for a little fun this month. Send me your favorite beauty quote and I’ll capture it on my board and share it on Instagram. Then I’ll round up all the contributions for a special post at the end of the month. Leave a comment here or send your thoughts on beauty to 52beautifulthings at gmail dot com. Keep in mind, the phrase has to fit on a felt board. Other future uses: Cocktail lists for parties. Positive vibes. Dinner Menus. Bible Verses. Love notes to Dylan or to myself. Show your friends just how quippy you can be. It has retro charm and modern day potential. Cutting out carbs seems sad. I love pasta. And potatoes. And carbs. Yet, I’m slowly pulling myself up on the Paleo bandwagon and trying to integrate healthier meals into the rotation. This Spiralizer will help. Come over for zoodles or maybe I’ll make you ribbons of butternut squash. The possibilities are endless. Let this cookbook be our guide. The old classic. I like it. It’s a reminder that we have choices in how we live our lives. That we can make changes, break out of routines, keep practicing until we get it right. Perhaps About Time captures these themes better, but one must pay homage to Bill Murray every February 2nd. I kill plants. But Pinterest promises me all these plants need to live is air. They can pull the nutrients they need from the AIR. I just have to soak them in water once a week and their tangly arms and blooming flowers can grace glass bottles and hang from my book shelves with little effort. I got six for my birthday and I’m still placing them around my house. And ps, did you know you can buy PLANTS on Amazon? Of course you can. My new favorite protein bar. Again, a Paleo thing. But these protein bars have real ingredients, low sugar, and are tasty! I like the mint chocolate flavor. Dylan prefers peanut butter . I like that I feel full in the morning and there are no mystery ingredients. Throw one in your purse. Stick on in your husband’s work bag. Have a snack. Share the love. You know those quote cards – the colorful ones, or maybe just black and white with neat font – that are so great to send to friends? The one’s they expanded into mugs, and t-shirts, and wall art, and journals because their beautiful aesthetics and wisdom combine into merchandise that we just have to have? Well maybe you don’t HAVE to have them, but I’m drawn to those 4 dollar 4 X 4 cards. And when I was in high school I collected them – in fact, I they are still duck taped to the back of my old bedroom door at my parents house. 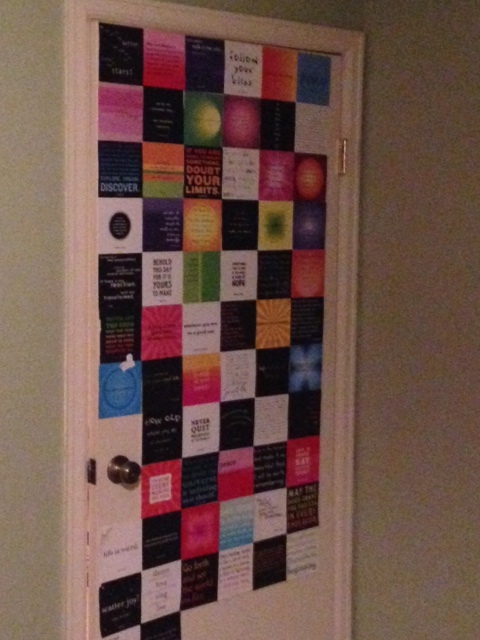 Thanks to my Dad who sent me a pic of my old bedroom door. Some things don’t change. 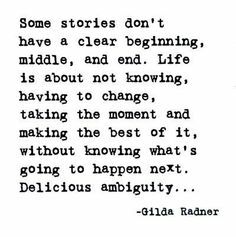 I talk about my love of quotes a lot here, and this week I’ve been thinking about Gilda Radner and the card that I put on my door when I was fifteen when I really had no hands on experience with living in ambiguity. Because when you are in high school, or when I was in high school, things were pretty clear for me – success was spelled out, roles of interaction defined. And I’m learning, this year, that those rules of predictability and behavior and pattern go right out the window the second you admit two things: 1) that my choices can not be made because of other people and 2) that other people are going to make choices without me in mind, and I’m likely going to have to adapt. Sometimes that makes me feel sad, but sometimes that makes me feel strong. This week, that is making me feel strong. Changes are happening, and have been happening, at work, but instead of feeling scared or insecure, I am being reminded by friends and loved ones and myself that I am strong, that I get to learn, that I get to choose how I want to adapt. 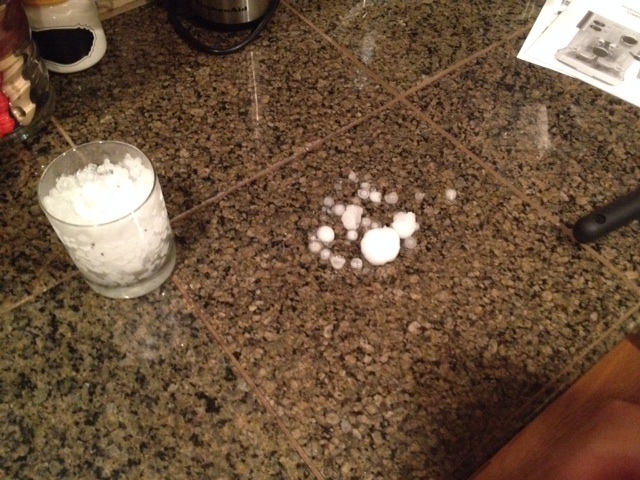 Too, this week was one of the biggest hail storms I have ever lived through. Ok lived through is a strong sentence, but I did hide in the bathroom and immediately called my mom. You may move out, but she’s still the first I’m gonna call. You can’t exactly tell from the picture below, but we had piles and piles of ping pong ball sized hail in our apartment complex. You know what else comes with apartment complex – or rather what isn’t included? Garages. That’s right, both of our cars got lots of ping pong sized indents on every panel of our vehicles. It adds texture, says the optimistic me. The realist me says it adds a hefty expense this month – even with insurance – and it’s sorta a ding to the budget. Our neighborhood got shredded, trees everywhere, gardens ruined, roof after roof needing replacement. And boy, was that one unpredictable. But you know what was beautiful this week? As Dylan and I went for an evening walk a few days ago I came across a wonderful cherry tree in someone’s backyard. The branches were overflowing onto the side walk – little bursts of red fruit holding so much promise saying, “I’m hanging on, I’m not quite ready yet to fall.” The way the sun was setting made them glow a little bit, and I love cherries. I may have to go knock on these people’s doors to ask if we can have some fruit that is extending over into public space. Cherries. How simple, how delightful – especially in the piles of leaves and shredded canopies, and carnage of something unpredictable. So I return to Gilda’s thoughts, and say you know what – I am not going to be able to predict things and protect myself by knowing what to expect – not all the time. If I can’t look for some little bursts of color, some wisdom in accepting I’m not going to know, my journey will be a bit more peaceful. Take time to enjoy the sweetness of cherries, have immense respect for the power of nature, and gratitude for insurance. Dancing with the unpredictable is honestly getting a little bit more fun. Just a little bit. What feels unpredictable to you? What surprised you in the midst of situations that seem to leave some destruction behind? 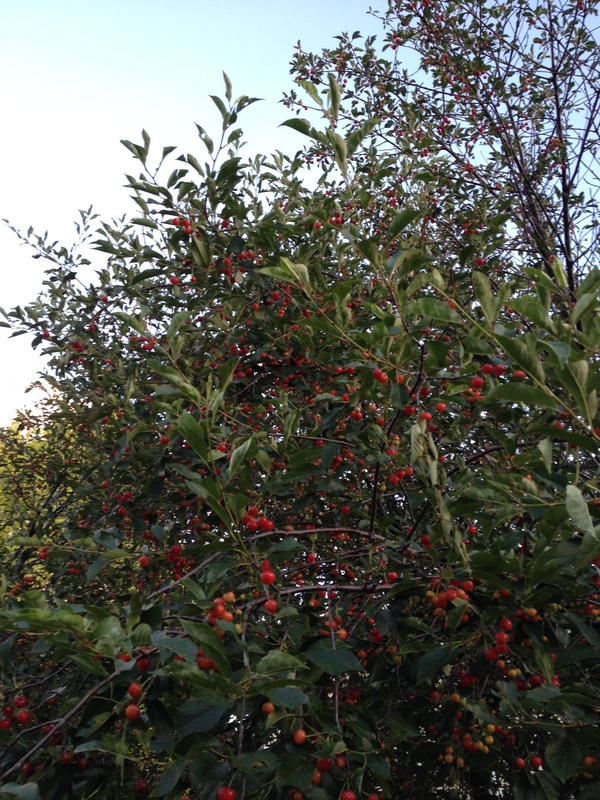 Do you grow fruit in your backyard?